Notes: A lavalier tie-clip microphone for use with VHF and UHF beltpack transmitters. 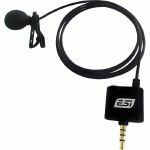 Notes: CosMik Lav is a professional omnidirectional lavalier microphone, providing high quality audio recording for mobile devices such as iPhone, iPad and various Android devices. The input sensitivity and level is optimized for these mobile devices, providing perfect signal levels in order to significantly improve the audio quality of your recordings. CosMik Lav is very easy to use and works with most audio and video recording apps, providing you with a hands-free solution to capture natural and clear sound of speeches, lectures, interviews, dictations and much more. The polar pattern of cosMik Lav is omnidirectional, which means that you will get a perfect response even if the speaker is moving while recording. The special connector makes it possible to connect your headset at the same time - providing you with a quick and easy solution to playback and listen to your recordings without unplugging the microphone first. The included clip can be attached to your shirt or lapel and the foam pop shield softens the voice and shields from wind noise. Notes: You're a visionary videographer, an intrepid journalist, a dedicated podcaster. And when you're out in the field, you want to be able to record high-quality audio for your projects with the hands-free convenience of a lavalier microphone, and you want to do it without breaking the bank. That's where iRig Mic Lav comes in, it's an ultra-affordable and compact professional-quality mobile lavalier microphone for iPhone, iPad, iPod touch and Android. iRig Mic Lav is chainable. That means it can double your recording power by letting you easily chain up to two iRig Mic Lav's to the same device. Each iRig Mic Lav captures high-quality audio thanks to its omnidirectional condenser capsule and foam pop shield. And recording convenience is taken to the next level thanks to its on-board headphone monitoring output, secure mounting clip, generous cable length and durable roadworthy design. And best of all, you can have all these premium features at a price as small as the device itself. iRig Mic Lav gives you the power to record great sounding audio anytime and anywhere. Designed to meet the exacting demands of broadcast professionals, its omnidirectional condenser capsule lets you capture a 30Hz - 16kHz frequency range of crystal-clear audio from all directions. It comes with a foam pop filter to eliminate vocal plosives, wind noises and other unwanted sounds. And like all good lavalier microphones, it comes with a durable mounting clip that you can easy mount on a t-shirt, lapel or other material for dependable and secure hands-free recording. Just clip it on, and you'll be ready to go. Capturing great audio in the field requires more than just superior microphone technology. To get the best sound, you have to be able to monitor your source as its being recorded. Not all lavalier microphones come with on-board monitoring, but iRig Mic Lav does. In fact, among major brands, it's the first mobile lavalier microphone to offer this feature. It comes with a combo 1/8" TRRS port that can be used to output audio to your favourite pair of headphones. Just set the toggle switch next to the port to "monitor" and plug in your headphones, and you'll be on your way to recording effortlessly amazing audio. There's a saying that goes something like, "two heads are better than one." The same can be said for microphones - when you're out in the field, sometimes you need to record more than one person. iRig Mic Lav lets you chain and record with up to two iRig Mic Lav's on the same device thanks to the same dual-purpose 1/8" TRRS port used for headphone monitoring. Simply set the toggle switch to "input," and then plug a second iRig Mic Lav in to record with two microphones. To monitor a dual iRig Mic Lav setup, you just need to set the switch on the second iRig Mic Lav's jack to "monitor," and then you'll be able to plug in your headphones. You never know what mobile device you'll have accessible while you're out conducting that next heated interview or spontaneous Youtube video. This can be a problem if a microphone is specifically made for one type of device. Fortunately, you'll never have that problem when iRig Mic Lav is in your pocket. It outputs its sound via an analog 1/8" TRRS output jack, and it captures the same high-quality audio no matter whether it's plugged into an iPhone or an Android device with a compatible TRRS input jack compliant with the CTIA/AHJ wiring standard. In other words, with iRig Mic Lav you can make quality recordings anytime, anywhere and on any mobile device. Pair iRig Mic Lav with VocaLive or EZ Voice and an iLoud portable speaker, and you'll have the perfect "hands-free" portable PA system that you can easily fit in a briefcase or backpack for trade shows, small group gatherings and other mobile presentations. With iRig Mic Lav, you're ready to record right out of the box thanks to its powerful suite of included apps. You get iRig Recorder FREE for iPhone, iPad and iPod touch and Android, a straightforward audio capture app that is great for everything from recording journalistic interviews to making podcasts while on the go (and everything in between). VocaLive is an expandable, powerful effects processor and multi-track recording app that's perfect for adding a creative touch to audio. EZ Voice for iPhone, iPad and Android is a streamlined and easy-to-use app loaded with vocal effects that make it easy to practice and record over any song stored in your device's music library. 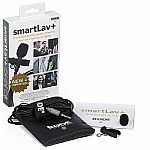 Notes: The smartLav+ is a broadcast-grade wearable microphone designed for use in a wide range of film, television and broadcast scenarios, or wherever broadcast quality audio is required in a discreet, portable format without the complication and expense of additional wireless equipment. With the smartLav+ the user simply mounts the microphone on the talent, connects it to a smartphone or tablet headset jack and records via the RODE Rec app for iOS, or any other audio app of their choice. A foam pop shield is supplied to minimise wind noise and vocal plosives (hard 'b', 't' and 'p' sounds), as well as a durable mounting clip with in-built cable management. Its Kevlarr reinforced cable ensures that you never stretch or snap your microphone under normal usage conditions. The smartLav+ is compatible with any audio app that accepts input from the headset connection, however it has been designed to pair perfectly with RODE's RODE Rec app for Apple iOS devices. RODE Rec turns the user's iOS device into a fully-featured field recorder, with a wide range of equalisation presets to suit various recording situations, in addition to professional editing functions and the ability to publish to SoundCloud and Dropbox direct from the app. 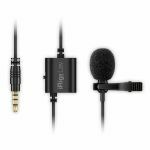 Notes: The MOTIV MVL Omnidirectional Condenser Lavalier Microphone is a quick and easy solution for clear audio in close-mic digital speech recording applications. With a discreet footprint and a 3.5mm (1/8") TRRS connector, the MVL works with any mobile phone or tablet equipped with recording capabilities by plugging directly into the headphone jack. Record and share on-the-go using the ShurePlus MOTIV iOS app or other digital recording platform to capture clear speech in interview, videography or public speaking environments. The MOTIV MVL Omnidirectional Condenser Lavalier Microphone is a quick and easy solution for clear audio in close-mic digital speech recording applications. 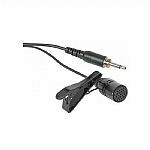 With a discreet footprint and a 3.5mm (1/8") TRRS connector, the MVL works with any mobile phone or tablet equipped with recording capabilities by plugging directly into the headphone jack. Record using the ShurePlus MOTIV iOS app or other digital recording platform to capture clear speech in interview, videography or public speaking environments, and share immediately via email or text. Designed and built to Shure technology standards, the durable MVL comes with a carrying pouch, windscreen and tie-clip mount for mobile audio recordings that greatly surpass the quality of onboard phone and tablet microphones. Your MVL microphone connects with most smartphones and tablets with 3.5 mm headphone input jack connection. You can record with any software you like. Next online in 4 hrs 57 mins.